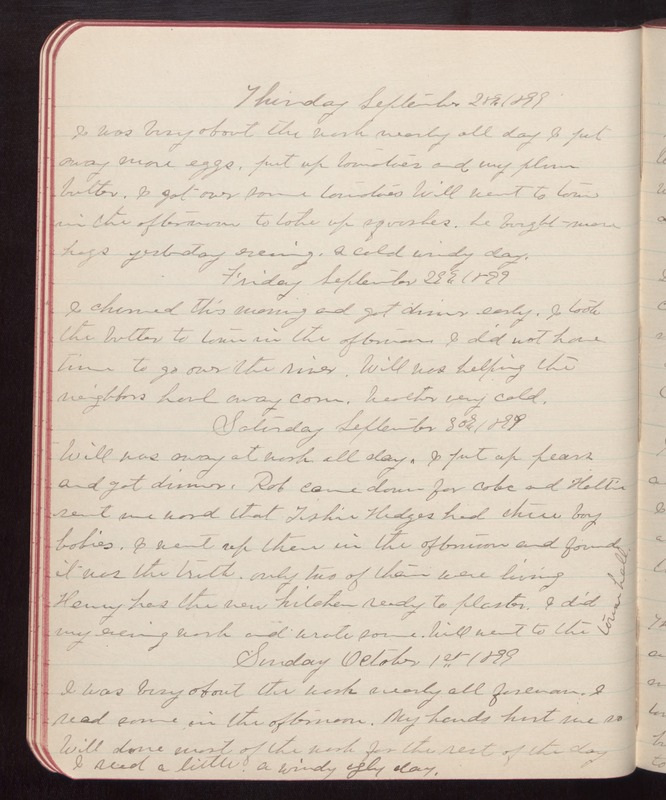 Thursday September 28th 1899 I was busy about the work nearly all day I put away more eggs, put up tomatoes and my plum butter. I got over some tomatoes Will went to town in the afternoon to take up squashes. he bought more hogs yesterday evening. A cold windy day. Friday September 29th 1899 I churned this morning and got dinner early. I took the butter to town in the afternoon. I did not have time to go over the river. Will was helping the neighbors haul away corn. Weather very cold. Saturday September 30th 1899 Will was away at work all day. I put up pears and got dinner. Rob came down for coke and Hattie sent me word that Tishie Hedges had three boy babies. I went up there in the afternoon and found it was the truth. only two of them were living Henry has the new kitchen ready to plaster. I did my evening work and wrote some. Will went to the town hall. Sunday October 1st 1899 I was busy about the work nearly all forenoon. I read some in the afternoon. My hands hurt me so Will done most of the work for the rest of the day I read a little. A windy ugly day.